Hi all, I just like to ask, do any of you still collect those mechanised toys called Zoids? Let me know. Haha, the Gordos? Last time call Stegosaur or something like that. 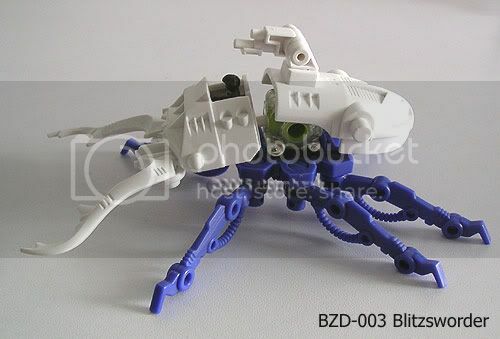 My first Zoid was the old release Sea Panther, look like hermit crab. That one disappear from my collection ages ago. I think my mom threw it away, damn sad also. I've been collecting them for the past 2 years or so. Very happy with my collection now. Got plenty of sets out there at Taka, OG, Metro, Isetan. Usually the big department stores stock them. Really??!! I am gonna go see and try to get my Stegosaur again. So how many you have in ur collection now? I got about 20+ maybe 30 Zoids at home now. Some limited edition items and some regular items. Going out to buy some more now. Your Stegosaur no more in red colour. Now is in green colour. The name is Gordos, now on sale - $29.95. 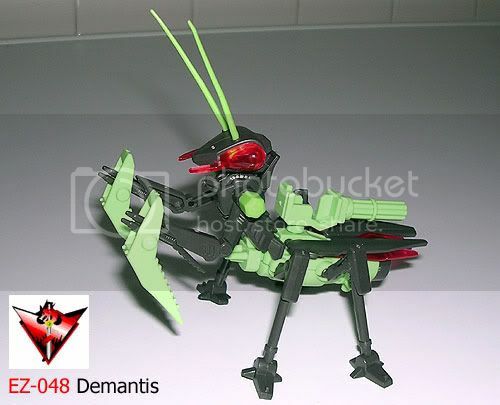 Bro... you are talking to a toy collector...of course i collect this.. ..not much but have some...i usually go for the insect types..
Insect type? I just bought these two critters home earlier. yup...i got that mantis, a scarab beetle and one more..cant remember what liao..
Must be the crayfish type - Maccurtis. Wanted to get one but they weren't on sale.. and the box was by Hasbro. Not nice at all. mine got no hasbro sign on it one.. all jap printing all over..
Ah so yours is the old box, from Tomy Japan. I haven't seen those for some time. Lots of the old models were taken off the shelves and replaced with newly released models from the Genesis series. I couldn't get myself some sets even though I just bought some customised parts kits (some sort of weapons or armour kits) for those older model kits. Anyway, went out to meet a seller earlier today and I brought home this.. a Helcat Noir! 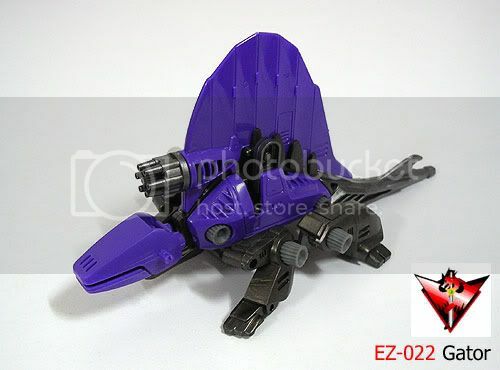 This critter was sold with copies of the Zoids VS. II game for the Nintendo Gamecube. Only a few pieces were released worldwide in the first few weeks after the game was released. After that all the sets came with a Desert Liger. So you could say this bugger is pretty rare and I'm glad I own it, for a good price of course. next time come my house we can look at toys too!! Justin, yah its damn swee. I like this critter. 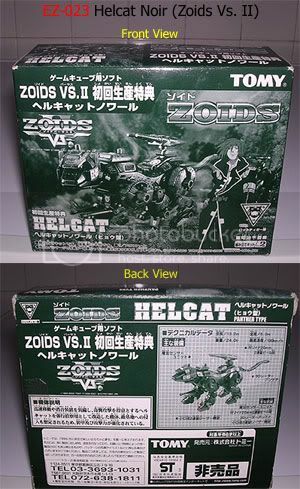 Saw pics of it online before on a good Zoids site. However I don't think I'll piece this fella together. He's way too precious to be pieced up. Just to tempt you oh insect-fetish man, here's my magazine exclusive limited edition Blitzsworder. I'm expecting an extra set to appear at my doorstep, or my post box, whichever the postman chooses, very soon. I used to keep the original series. Where the head was white in color and holds a driver/pilot. All don't know go where already! Shame! here's my magazine exclusive limited edition Blitzsworder. This is nice! I had a miniture version of this one. It was maroon and grey. Benny, yours was the Saicurtis, a scarab-beetle type. That model is a little bigger than the Blitzsworder in the picture. This fella is a new release Blox-type Zoid and only available with a copy of the Dengeki hobby magazine. Not too sure. It was about 5 to 8 cm only. I think it should be the Saicurtis, since its the only beetle / insect type that has that colour scheme. Is it this? See the pic in the link.